Asthma and chronic obstructive pulmonary disease are separate diseases, but recent research has uncovered more information about patients who have symptoms of both and suffer from asthma-COPD overlap syndrome (ACOS). A Sunday symposium will examine these findings and discuss diagnosis and treatment. “Bringing Order to the Chaos of ACOS” will feature six speakers who will discuss how to distinguish ACOS from asthma and COPD, the shared immunity in asthma and COPD, the genetic origins of ACOS, the role of smoking in asthma, and ACOS therapies. The session is from 2:15 to 4:15 p.m. Sunday in Moscone Center, Room 2005/2007 (West Building, Level 2). “ACOS is a real entity, but it is not yet defined. The Global Initiative for Asthma 2015 guidelines describe ACOS. In the last two years, there has been an explosion of interest and papers published on the topic. 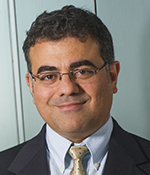 However, we still lack a full understanding of this condition,” says Amir A. Zeki, MD, one of the session chairs. Although research has opened doors to learning more about ACOS, many questions remain. It is known that 15-55 percent of patients with obstructive lung disease have ACOS. Compared to other patients, they have more symptoms, greater declines in lung function, an increased risk of severe exacerbations, and a possibility of reduced life span. Speakers will discuss molecular, pathophysiological, and clinical features of ACOS and how this information fits in with the differing British and Dutch hypotheses about the pathogenesis of COPD, which were developed in the 1960s. “My hope is that the audience will also have a chance to discuss and appreciate the significant heterogeneity and overlap between asthma and COPD, where ACOS serves as an emerging and important clinical phenotype linking both diseases,” Dr. Zeki says. “Bringing Order to the Chaos of ACOS (Asthma-COPD Overlap Syndrome)” (A86) is supported by educational grants from AstraZeneca LP, Genentech, GlaxoSmithKline, Meda Pharmaceuticals, Inc., and Teva Pharmaceuticals. Several other education sessions focus on the diagnosis and treatment of asthma. “Joint ATS/ERS/JRS Symposium on Severe Asthma: A Global Perspective” (A6) is supported by educational grants from AstraZeneca LP, Genentech, GlaxoSmithKline, Meda Pharmaceuticals, Inc., and Teva Pharmaceuticals. “New Concepts in Asthma Biology” (B10) is supported by educational grants from AstraZeneca LP, Genentech, GlaxoSmithKline, Meda Pharmaceuticals, Inc., Sanofi US and Regeneron Pharmaceuticals, and Teva Pharmaceuticals. “Biomarkers for Precision Medicine in Asthma” (K7) is supported by educational grants from AstraZeneca LP, Genentech, GlaxoSmithKline, Meda Pharmaceuticals, Inc., Sanofi US and Regeneron Pharmaceuticals, and Teva Pharmaceuticals. “Clinical Year in Review 4: Asthma” (D1) is supported by educational grants from Actelion Pharmaceuticals US, Inc., AstraZeneca LP, Boehringer Ingelheim Pharmaceuticals, Inc., Genentech, GlaxoSmithKline, Meda Pharmaceuticals, Inc., Sanofi US and Regeneron Pharmaceuticals, Teva Pharmaceuticals, and United Therapeutics Corporation. “Exploiting GPCRS for New and Improved Asthma Medicine (D7) is supported by educational grants from AstraZeneca LP, Genentech, GlaxoSmithKline, Meda Pharmaceuticals, Inc., and Teva Pharmaceuticals.